The relative risk of contracting a deep leg and/or pelvic vein thrombosis during pregnancy and the confinement period is 5 to 6 times higher than in non-pregnant women. The data on the frequency of thrombosis are scattered over a wide range, because the objective diagnostic procedures such as phlebography or the radiofibrinogen test are usually only used with great reservation, if at all, in pregnancy. Furthermore, the clinical signs of thrombosis are not completely reliable and it is often difficult to distinguish between superficial thrombophlebitis and deep thrombosis. The peak incidence of thrombosis in pregnancy is in the second trimester of pregnancy. The left leg is affected very much more frequently than the right. The cause of this is probably the right iliac artery compressing the left iliac vein as it crosses it. 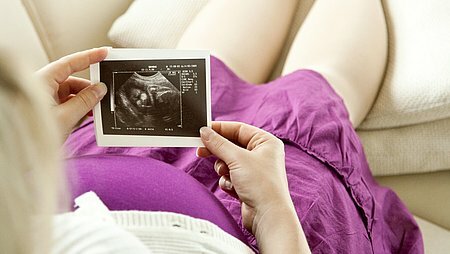 Thrombosis in pregnancy can be the result of alterations in normal blood flow in the lower limbs caused by obstruction of venous return flow by the growing uterus. The risk of thrombosis is heightened by corresponding changes in the coagulation system, because a marked increase synthesis of plasma coagulation factors and the platelets is often seen. In particular, there may be a sharp increase in fibrinogen levels up to twice the normal level (400 to 650 mg/dL) during late pregnancy. Furthermore, the factors in the fibrinolysis system are also seen to decrease. The deep leg and pelvic vein thromboses seen after Caesarean section account for about three to eight percent in the absence of anticoagulation prophylaxis, i.e. they are four to eight times more common than after vaginal delivery. The death rate (mortality) from embolism amounts to two to three percent and is thus 10 times higher than after spontaneous deliveries. 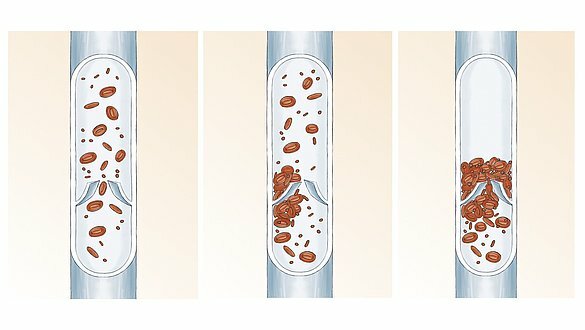 Surgical trauma to vessels and tissues with the increased presence of thromboplastic material in the circulation may be considered as the cause. Patients who develop an infection of the periuterine segments of the vessels are at particular risk. How can thrombophlebitis be treated? 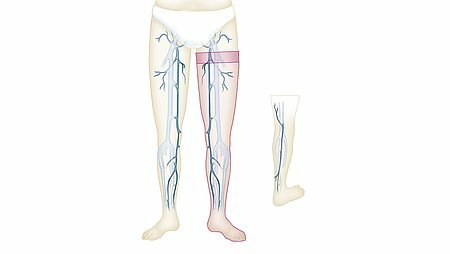 Thrombophlebitis is a superficial inflammation that occurs particularly often along the long or short saphenous veins. As a rule, the clots are small and separation is uncommon in deep veins, due to the course of the veins and the anatomy of the valves. Treatment consists of local physical measures, namely compression stockings, alcohol compresses and mobilisation of the patients. The compression therapy promotes the efficiency of the muscle pump in the legs and thus venous return, which prevents progression of the thrombosis. Pregnant women at particular risk of thromboembolic complications should be registered as early as possible. Besides physical (compression garments) and physiotherapy prophylaxis, thrombosis prophylaxis with drugs may be necessary depending on how serious the risk is. Low molecular heparin (e.g. Fragmin P or Fraxiparin) is normally used because it is safe and simple to administer. These drugs are administered once daily using a prefilled syringe. A series of congenital and acquired diseases leads to a higher incidence of thromboembolic complications in normal life and therefore in pregnancy all the more so. Besides treatment of the underlying disease, particularly careful physical and medicamentous thrombosis prevention is necessary in pregnancy.